TWLB will be played at 5:00 PM and 5:30 PM EDT with a 6 squad format. Everyone plays each other twice over the course of seven weeks. Last edited by Turban; 04-01-2019, 06:43 PM. 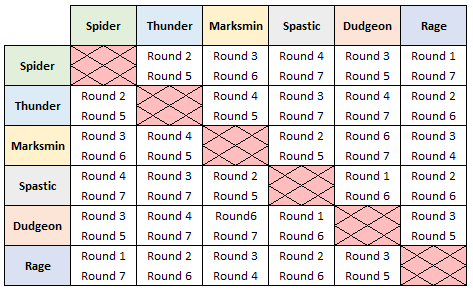 Marksmin vs Spider (Round 1) will be replayed at 5:30 PM EDT on Round 3. Updated schedule images, and scheduled two more replays. Marksmin vs Thunder will be replayed during Round 5 at 5:30 PM EDT with a conditional score. Games with an asterisk on the left side are replays.